Eugenol, C10H12O2, an isomer of position to betelphenol is found widely distributed, especially among the Myrtaceae and Lauraceae. In largest amount it is found in oil of cloves and oil of clove stems. It also occurs in the oils of calamus, galangal, Asarum arifolium, A. Blumei, Japanese staranise, kobuschi, ylang-ylang, cananga (from yellow blossoms), nutmeg, boldo leaves, cinnamon leaves, cinnamon root, the bark of Cinnamo-mum pedatinervium, C. pedunculatum, in the oil from Seychelles cinnamon bark, in the oils from the leaves and stem of Cin-namomum Loureirii, in the oils of camphor, culilawan, clove bark (? ), sassafras, massoy bark, laurel leaves, apopin, Californian laurel, rose, Geum urbanum, cassie buds, myrrh, cascarilla, canella alba, pimenta, bay, Bermuda bay berries, Japanese basi-licum, in the oil of a species of Basilicum from Mayotta, and in patchouli. 1) Bertram and Gildemeister, Journ. f. prakt. Chem. IF. 39 (1889), 350. 2) Report of Schimmel & Co. October 1907, 17. In plants, eugenol is occasionally found in the form of a glucoside from which it can be obtained by means of hydrolysis produced by ferment action. In connection with eugenol prepared on a large scale, Schimmel & Co. observed: d15o 1,0713 to 1,074; nD20o1,541 to 1,542; soluble in 5 to 6 vols. of 50 p. c. alcohol, in 2 to 3 vols. of 60 p. c. and in 1 to 2 vols. of 70 p. c. alcohol. In alcoholic solution, eugenol produces a blue color with ferric chloride. Upon oxidation (the best results are obtained with the acetic ester), it yields vanillin and vanillic acid, together with small amounts of homovanillic acid. 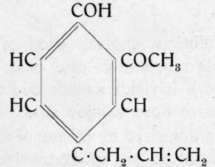 It is readily characterized by means of the benzoate, m. p. 69 to 70°, obtained with the aid of benzoyl chloride; also by the phenylurethane, m. p. 95,50,3) and its diphenylurethane, m. p. 107 to 108°.4) Of its bromides, the dibromide, C10H12Br2O2, m. p. 80°, and the tetrabromide, m. p. 118 to 119°, should be mentioned. For the quantitative determination of eugenol see the chapter on the "Estimation of volatile oils". Eugenol is used in perfumery as well as in pharmacy. By far the largest amounts, however, are used in the manufacture of vanillin.